In Eat Pray Love, Elizabeth Gilbert mentions that some people have neurotic, intuitive, introverted, control freak, anxious tendencies. They are unable to turn off the chatter in their minds. Some of us intellectualize our emotions and seek answers to certain questions through scholarly endeavors instead of prayer. There is an internal tug of war between faith and fact and we are restless well into adulthood. I began studying psychology, religion, philosophy and spirituality as a Freshman in high school. I had questions just like Elizabeth Gilbert, just like many of you. I found endless answers to my questions in those texts. But I still couldn’t seem to answer two: Who am I? Why am I in so much pain? The Upanishads (followed closely by The Gospel of Thomas), is my favorite spiritual text. For those of you who are not familiar with it, Upanishad means mystic or inner teachings. I have read it many times. Still to this day it stirs up confusion, anger, sadness and joy. But of all the texts I’ve read, it spoke to me more than any other. It told me awhile ago that I must know myself by being alone with myself completely. Of course, it didn’t tell me a damn thing. I was telling myself to experience pure solitude. Reading major (and minor) texts does not an Enlightened One make. First comes knowledge and awareness. We must discover the Self before we can destroy the Ego and become Enlightened, as Carl Jung brilliantly articulates in all of his work. But Awareness is meaningless without Action, as we learn from Jesus and Buddha. I took Action in 2008 when I quit my job, moved to Virginia, started grad school, went to therapy, chose three years of celibacy, practiced yoga, changed my diet, etc. Most importantly, I took Action when I forgave myself and others for the past so I could let go and move forward. Forgiveness is Love. This has not been an easy process and it will continue (I hope) until I die. Freeing oneself from the Ego is probably the most difficult of all human experiences and I can only hope I will be free of even 1/1000th of mine in this lifetime. If it were easy, we would all be Enlightened. Kaivalya is a minor Upanishad. Kaivalya means Aloneness. The text teaches individuals in their last stage of life how to become liberated by renouncing a life driven by desire and by realizing they are Brahman. Before I started grad school, I often confused happiness with pleasure. I often sought out sources of pleasure from the external world to make myself feel happy because I was so so very unhappy and lost. I was also unable to meditate. I was unable to be still and could not turn off the chatter I mentioned earlier. For me the chatter was very negative and it usually involved a self-depleting, fearful, self-deprecating internal dialogue. I was not good enough. I did not deserve to be happy. Something was wrong with me. Then I started grad school. And everything changed. I was truly alone with myself for the first time. It was a horrible, ugly, painful, terrifying experience and yet beautiful and liberating. After the emotional and physical withdrawal from my past life, I formed new patterns of behavior and my brain formed a new cognitive blueprint. I was happy. Happy. Content. I pushed that contentment out in the world, into my relationships, into my heart, into my work, into everything. And it has flooded back to me in a way I never could have imagined. It has come back to me in such an amazing way that the girl I once was would have rejected it outright. She would not have accepted it. I am now a woman who not only accepts amazing gifts from the Universe, but knows she deserves them. And I don’t mean I deserve happiness more than anyone else or that my reason for doing certain things is to get something in return. I mean everyone in the Universe deserves happiness and contentment. To be happy here or there or anywhere or with this or with that or with whomever, one must confront the Self and be content with his or her own mind, body and soul. I had to find happiness in Me to find happiness outside of this body in which I live. All of this has little to do with the point of this post. This post is about a moment of solitude this week that filled my soul to the brim will stillness and pure bliss. This post is about Kaivalya. It is about blissful solitude in Glasgow. See, I have this amazing job. I was in Scotland last week for a series of meetings and a conference in which scientists, engineers, naval architects, grad students and other Human Factors researchers from 20 countries meet to discuss human performance issues at sea. On Wednesday, I took a break from conference sessions discussing updated physiological models of motion sickness on high speed craft. I decided I needed to be alone. I had only been alone to sleep in my hotel room since Sunday and it was getting to me. 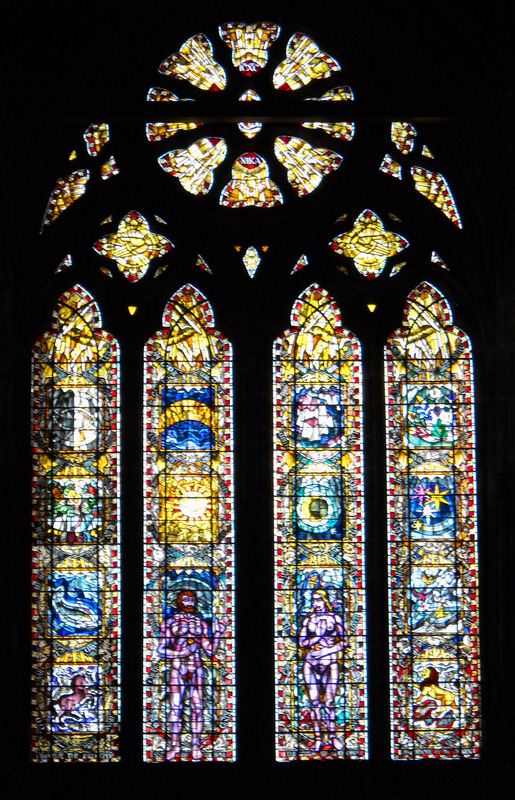 I walked from Strathclyde University to Glasgow Cathedral. After walking through the cathedral, I felt particularly emotional as I often do in old places of worship. My mom has always teased me about this because I am not religious and do not believe in God in the Christian sense of the word. 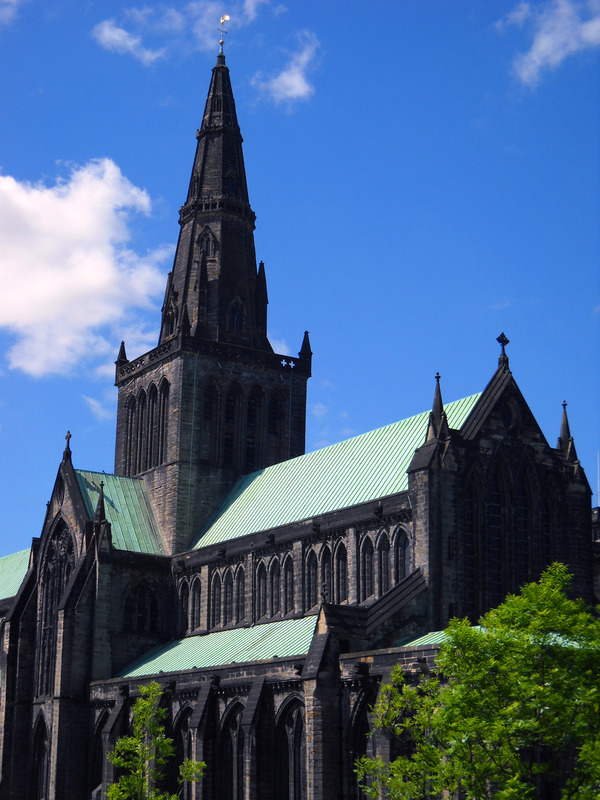 Glasgow Cathedral (or High Kirk of Glasgow, St. Kentigern’s, or St. Mungo’s Cathedral) was constructed in sections between the 11th and 15th century. 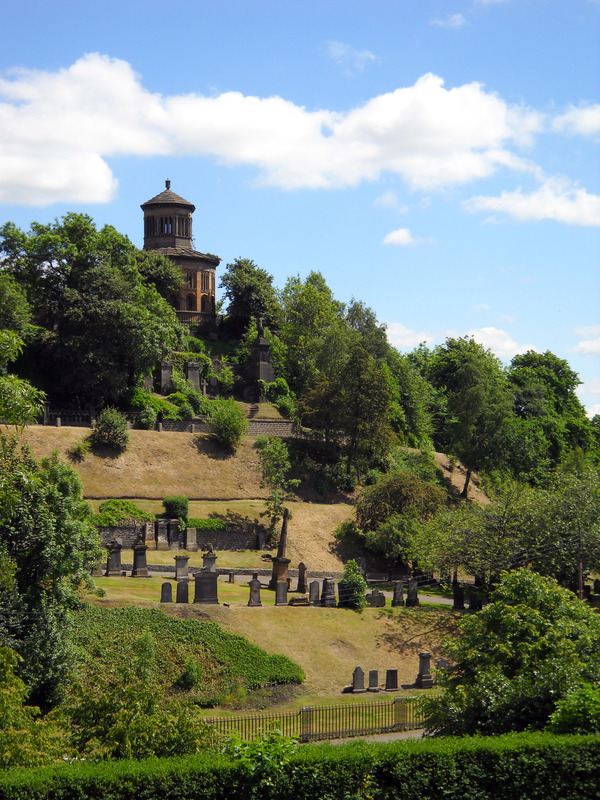 It is one of the oldest Celtic churches in Scotland to survive the Reformation. Across the highway you can see the Necropolis (see below). I love cemeteries, so I thought I’d pop over for a few minutes. I sat still for an hour, accepting that this is my life. I sat still, thankful for the bliss I am able to feel in solitude. I was thankful for these last few years in which I have been alone with myself and faced some of the most challenging times of life up to this point with grace and strength. There was no chatter. I had nothing negative to say about myself. I deserve this moment. My heart and mind were as still as my body. And I could say with full knowledge and faith that my Heaven was on Earth in that moment. My Heaven is always with me, in my mind, in my heart, in every moment. Happiness will always be with me because I can be alone with myself. I found your blog while looking at RefWork’s Facebook page! Love this post on solitude. I found your blog while checking out RefWorks’ Facebook page…love this post! I think everyone needs to learn how to be alone, happy and content. I went through a really tough time where I spent a lot of time solo and that time with just me has served me well, as I am now completely content and even crave time to be with just me. I think having solo time definitely makes you a better partner once you find the right person! I’m sorry you went through a tough time. But I am glad you are now content! I don’t think enough people realized how important it is to be alone. Some think that being alone for a day, a week or some absurd short period of time is enough. Sadly, it’s not. True, we’re humans and we are meant for companionship. But the constant push for companionship in society has made us immature as humans. For one to fully appreciate life alone takes a long time. But when one actually does come to that realization, that person is by far more mature and further off in life than the rest of society. I was in some kind of relationship beginning at 14 until I was 24. I was so broken and was always searching for someone to complete me even though I swore up and down I was perfectly independent. It’s funny that now, looking back, I was not honest with myself because I was afraid to be alone. The last 3 years I’ve become a whole person on my own because I was alone. It is incredibly rewarding even if it has its moments. I guess you could say that now I’ve gotten back into dating… trying to figure out if I can even establish relationships until I’m finished with grad school. Le sigh. I don’t know that you can know how happy hearing this makes me. 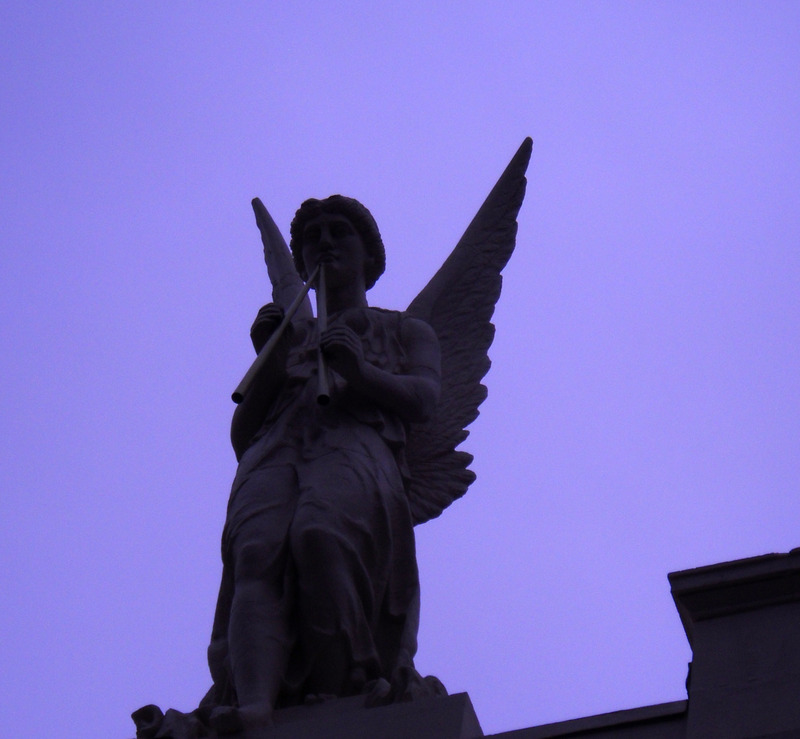 I also have the same overwhelming feeling in old places of worship – pagan or not. I’ve thought long and hard about why that is – and I think there’s a small part of me that wishes I “belonged” to something like that. It makes me wish that I belonged to this thing that I could just put my thoughts and problems on…it just seems to make life easier or something. The other part of it I think is how I begin to think of how many people over the ages have stood in that same spot and in awe. And to feel that energy is just overwhelming. <3 I get the same feeling at concerts that I do in places of worship. Sometimes more so at shows actually. But that is more related to how I respond to stimuli and blah blah blah psychobabble. Hehe. It is definitely related to that "belonging" feeling that you describe. I love being somewhere that is so old, with so much history. It's such a beautiful realization that people have brought their most personal thoughts and feelings into a place like a church. There are things people have shared with “God” that they have never told a living soul. All of that energy will be in those places forever.